How Long Does the Flu (Influenza) Last in Seniors? 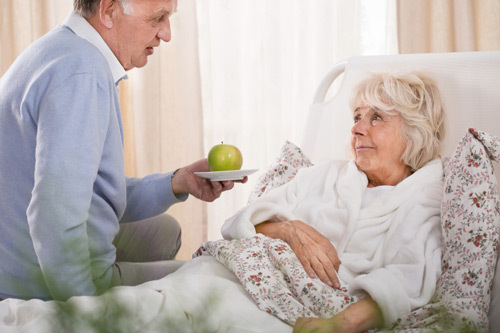 Home » General Health » How Long Does the Flu (Influenza) Last in Seniors? Influenza, or the flu, can affect everybody, but how long does the flu last in seniors? Elderly people have weaker immune systems, so they have a much harder time fighting off illnesses and infections, and subsequently it typically takes them longer than average to fight off the flu. We don’t think much of getting influenza today aside from the discomfort it brings, but before there were vaccinations, the flu was responsible for killing millions of people, particularly during the influenza pandemic of 1918. What Is the Duration of the Flu? The flu is contagious; it can spread rapidly between people when droplets are expelled into the air, typically by coughing and sneezing, and inhaled by an uninfected person. It can also be spread by touching common surfaces, such as doorknobs and keyboards. How long the flu lasts in adults depends on the person, but in general, for healthy adults, and without the disease developing any complications, the flu usually lasts from three to 10 days, but that period can be as long as two weeks. Day one: A high fever followed by shivering, headaches, and muscle aches. Days two to three: The fever should be backing off, and intense fatigue and nausea will kick in. This is when most people stay in bed all day simply because they lack the energy to move much. Days three to five: Nasal congestion will develop. Headaches will still be lingering and there might be facial pain. Days five to fourteen: Symptoms will begin to disappear but the fatigue can linger for up to another week. Fatigue is usually the last symptom to hang around and takes the longest to resolve. How long the flu lasts in the elderly depends on how healthy they are and how strong their immune systems are; a weakened immune system will likely mean the flu and its related symptoms, including headache, cough, and fever, will take longer to pass. If an elderly person (i.e., over 80) gets the flu, they should go to their doctor right away because of the complications that can occur for those in that age bracket. For healthy adults, it’s best to stay home when the flu hits, because you don’t want to be spreading it to others. Unless pneumonia settles in, there’s basically nothing a doctor can do for the flu. The best remedy is to get a lot of rest, drink plenty of fluids, and take pain relievers for the headache. Within a few days, the worst of it will pass. The contagious period of the flu usually begins a day or two before symptoms present themselves, and can last for about five to seven days afterwards, though sometimes the contagious period lasts for 10 days. Some people, such as children and those with weakened immune systems, are contagious for a little longer. “Flu in Adults,” E Medicine Health web site; http://www.emedicinehealth.com/flu_in_adults/page5_em.htm#what_is_the_contagious_period_for_flu_in_adults, last accessed February 26, 2016. “How Long Does the Flu Last?,” Medicine Net web site; http://www.medicinenet.com/influenza/page3.htm, last accessed February 26, 2016. “Influenza (Flu) – Causes,” Mayo Clinic web site, September 29, 2015; http://www.mayoclinic.org/diseases-conditions/flu/basics/causes/con-20035101, last accessed February 25, 2016.